What happens when you have Guy Ritchie, Henry Cavill, Armie Hammer and Hugh Grant get together for a film? Action, drama, humor and good looks! 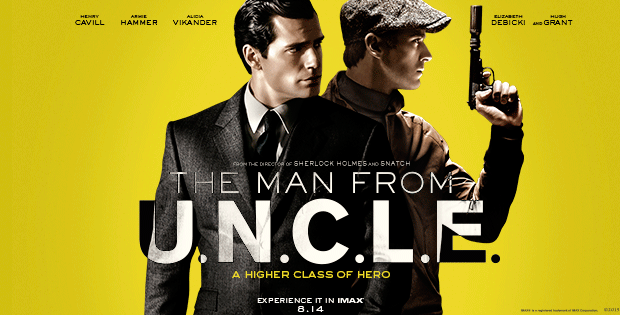 This is the film “The Man from U.N.C.L.E” where U.N.C.L.E means United Network Command for Law and Enforcement, this American TV series has been adapted into a film by British director Guy Ritchie. The film opens as CIA Agent Napoleon Solo (Henry Cavill) is heading to meet scientist Udo Teller’s daughter Gaby (Alicia Vikander). On the way he realizes he is being followed and soon Gaby, who is a mechanic lends him a car and there is a car chase which ends up between the walls of two high rise flats. How do they get out of it and why are they being followed by the Russian KGB Agent Illya Kuryakin (Armie Hammer) is fun to watch. It soon becomes apparent that Napoleon, Illya and Gaby have to work together to find her father who has been captured by the Vincigueara family to make a nuclear bomb. This American-Russian collaboration becomes interesting as Illya has to play the romantic architect fiancé to Gaby and Napoleon gets busy in distracting heiress Victoria Vincigueara (Elizabeth Debicki). Unfortunately Victoria proves to be a smart and crafty villain and she is easily one step ahead of these agents who have to call in the MI 6 Agent Alexander Waverly (Hugh Grant) to help them get out of this electrifying situation of bomb, wires and guns. They are successful in this mission and just as they think they are going to return to their respective agent lives, Alexander Waverly returns and offers them a new outfit U.N.C.L.E. which prompts you for a sequel in the future to come. Guy Ritchie loves the old-school look and the film is authentic in fashion and sets of the 70s. Daniel Pemberton’s music adds the right touch to the pace of action and combined Guy and Daniel could easily make a Bollywood film like “Kill Dill”. Henry Cavill carries the suit of Superman and it is a lovely change to see him as a handsome, clever CIA Agent, unfortunately Armie Hammer is taller, more good looking and excellent with his Russian accent. Elizabeth Debicki is excellent and almost reminds you of Uma Thurman from Pulp Fiction. Sit back, have a drink or popcorn but don’t miss this smooth action spy film and ladies Hugh Grant looks superb in his grey looks and MI 6 outfit.